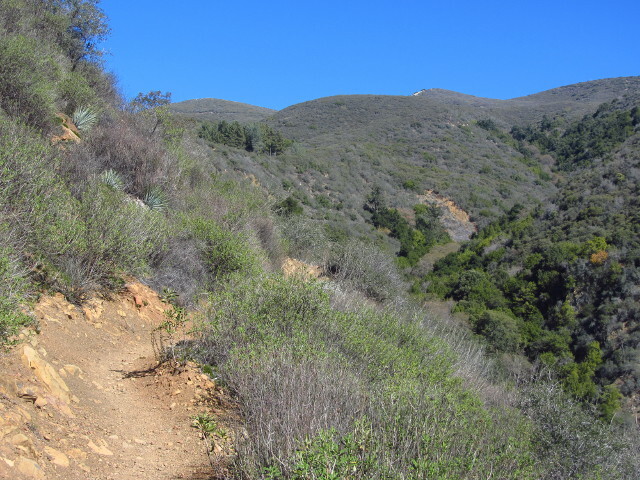 Heading down to Ojai again, but this time keeping to 150 a little longer where a number of well used, but unfamiliar to me, trail heads make their start to climb up to Nordhoff above. I hoped to see Horn Canyon Road heading off to the right as I proceeded to The Thatcher School, but had no such luck and had to enter the school grounds just as every listing for how to get there says. Keeping right, I found myself on a dirt road that soon opened into a parking area next to a gate. A sign with the name and trail number beside the gate made it clear I was in the right place, so I parked. I'd asked a fellow on the way, since I get uncomfortable driving around school campuses when not a student there, but found someone who lived by Pratt Trail so hadn't looked around the trails here. Now, the part of Pratt I've been on is nice enough, but really you've got to have at least 3 or 4 trails in your repertoire. Since blundering on while keeping right worked, I stepped out into the chill, shaded lot and started up the trail. I didn't forget my gloves this time, but I almost neglected my hat. 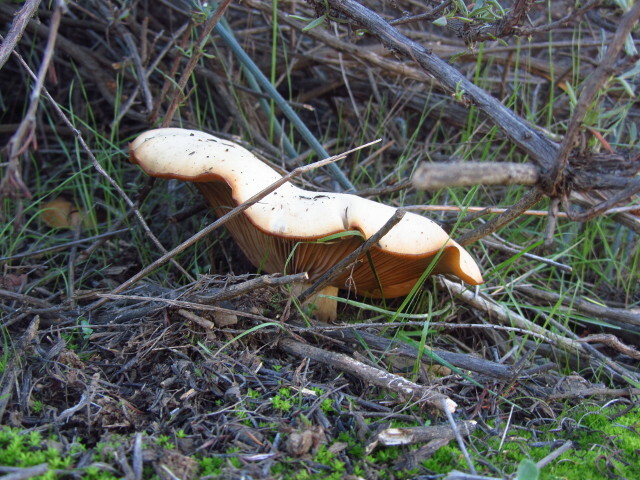 A single massive mushroom by the side of the trail. The first part of the trail is through a wide flat area with composting waste piled up around the place, but the correct route is clear. After the compost, the old road continues, so the trail is quite wide. 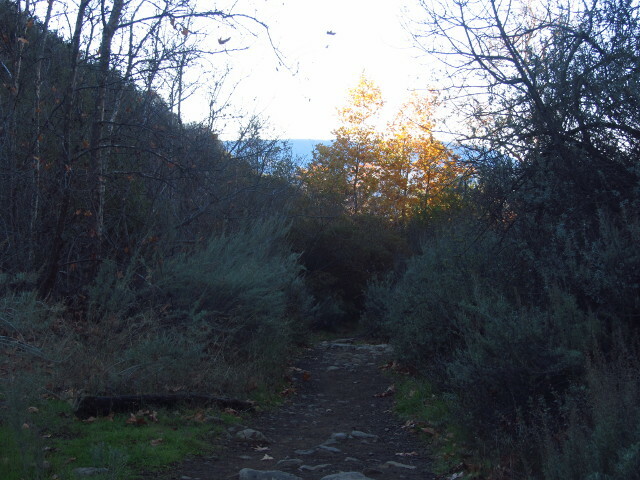 Smaller trails break off often to either side, but the main route remains obvious. Most are unmarked, but one is signed. Old iron and new PVC pipes run along the side, the later carrying water to those below. Power lines hang overhead. The wide trail was once a road, but is now maintained for horses. It was a bit cold in the shade on this winter day. Likely not an official trail, but someone feels it is important enough to mark with a cairn. 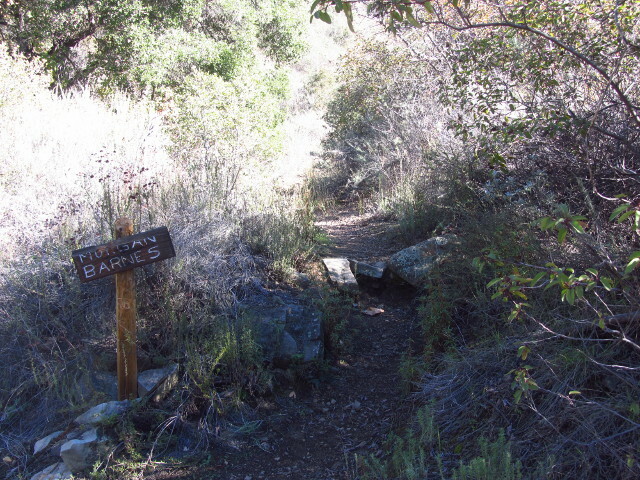 Morgan Barnes, one signed trail which is marked on the 1995 USGS 7.5' Ojai quad and can be followed in a big loop back to the parking via Thatcher Canyon. It is maintained by students at the school. Passing into the sun, I was warmed a little. The trail crosses the stream a few times, each time over a load of gravel that leave the trail dry. Just above the second crossing, the PVC pipe stops. Past the third crossing, the power lines stop near a well, but have been cut so the well is no longer in use. I found myself hiking with some noisy neighbors as I climbed. Two were faster and two were slower and they liked to call to each other a bit. Above the last sighting of PVC pipe, water can be heard and occasionally seen. The trail crosses the stream one last time, this time requiring rock hopping, and starts up a tributary canyon to the right. It closely follows the old iron pipe. I noticed a section here and there of riveted pipe, some with the tar water sealing still, then slowly the pre-1890 pipe (if memory serves and the information along the Ben Overturff Trail is accurate) begins to dominate. The trail turns again and starts climbing the canyon side, leaving the pipes behind. 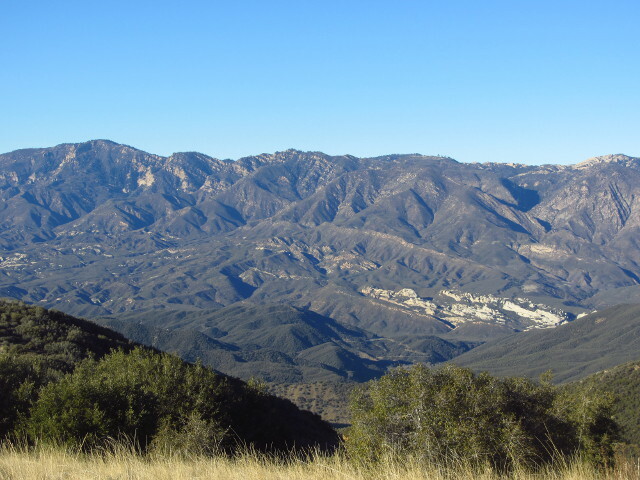 The Ojai valley slowly comes into view below and then a stand of pines above. 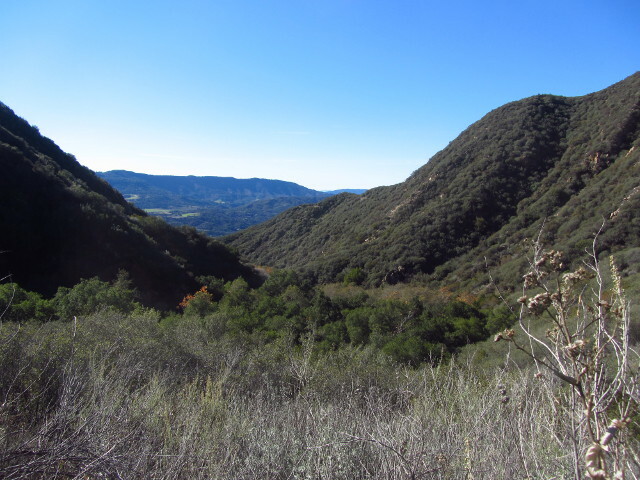 The view down the lower section of Horn Canyon into Ojai. A segment of the trail after it has started to climb as The Pines first comes into view. 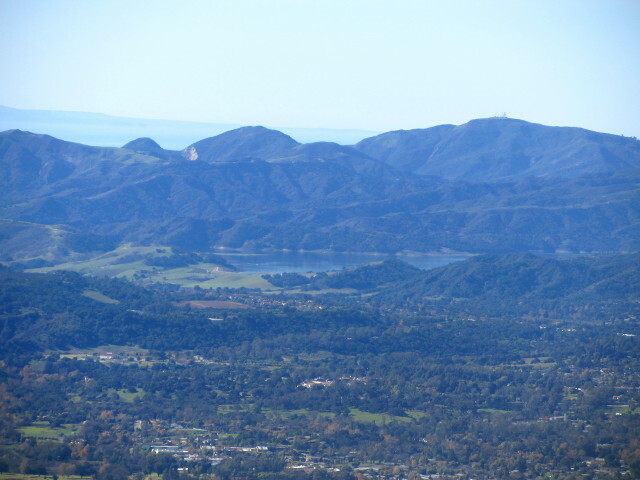 Lake Casitas and the Ojai Valley. The air was noticeably cooler underneath the trees. This single crop of trees among the chaparral is suspicious even before noticing the wicked spikes on their cones. Ponderosa should be higher up. In the center, there is a campfire ring with benches. Off to the side is another set up for cooking with a table and bench. 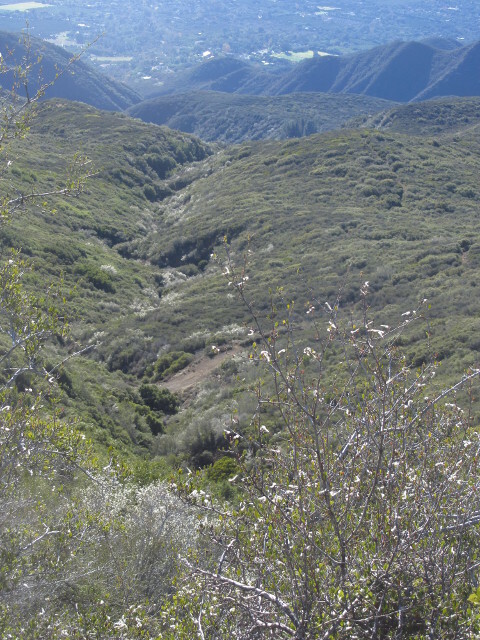 Beside it, an opening in the chaparral allows looking out over the valley and a bit of ocean occupied by Anacapa. On the other side, a horse trough slowly overflows with water provided by a long bit of irrigation hose. Use trails along it explore where the water comes from. 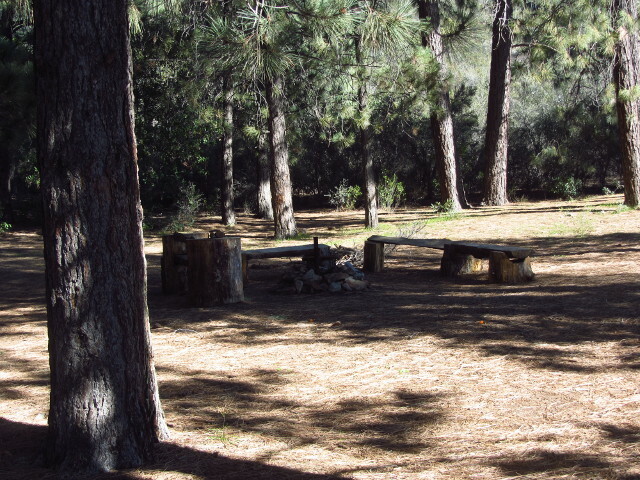 Campfire and grill set up in The Pines with plenty of split log benches. I found another hiker under the trees when I arrived. My noisy neighbors made it up after he left, while I was eating. The fast ones had gone back down to offer encouragement to the slower ones. The trail exits again at the top of the trees to the right and is much narrower above. 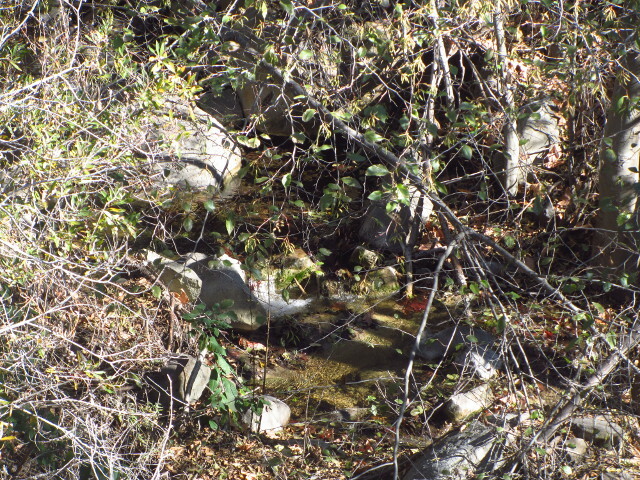 It follows along above the tributary canyon for the most part. I took it after an initial false start looking for trail near the trough. At first, there is a bit of encroaching brush, but then it dries out a bit and widens again. I wiped off a couple ticks. A signpost to the side with its signs removed marks an abandoned trail that is now just a small tunnel. The air gradually cooled as I climbed and the views to the islands opened up. I started to notice some snow remaining in the shadows above through the minor heat haze. At one point, I spotted some antennas as well. 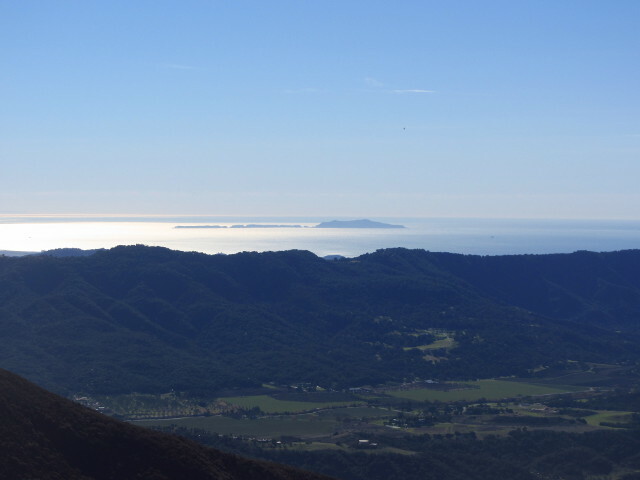 Anacapa Island in a glistening sea past the upper Ojai Valley. The large mass of land that is San Nicolas could be seen beyond it and to the left, but started to fade in the afternoon light. 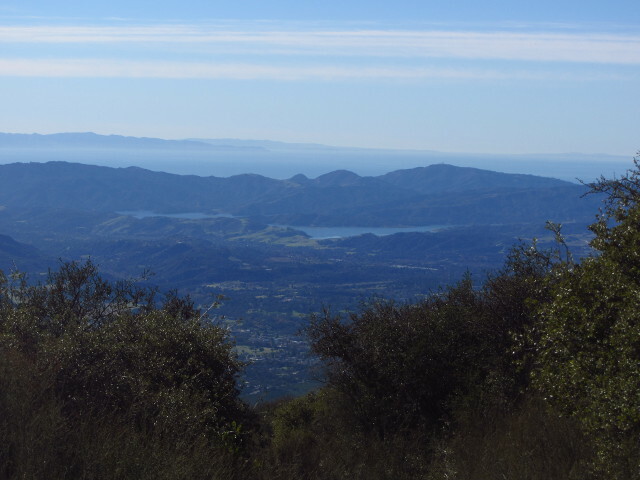 Santa Cruz and Santa Rosa Islands overlapping each other with San Miguel Island off to the right, seen beyond Lake Casitas. I arrived at Sisar Road. I followed a trail with many foot prints and one tire track. Here, numerous tire tracks and no footprints passed on the road. The wiggle a lot on the uphill and are much smoother coming down. One set of footprints turned here and took off in the direction of Chief Peak. Things were becoming much more familiar. I could just see the tower on Nordhoff Peak in the distance. The trail down is signed, but the trail up is not. A brief jog to the right brought me to the continuation and I started to climb again. The grade is a little easier on this last section. The trail is signed for going down from Sisar Road, but otherwise there seem to be no destinations. Looking down the tributary that meets Horn Canyon down below The Pines. 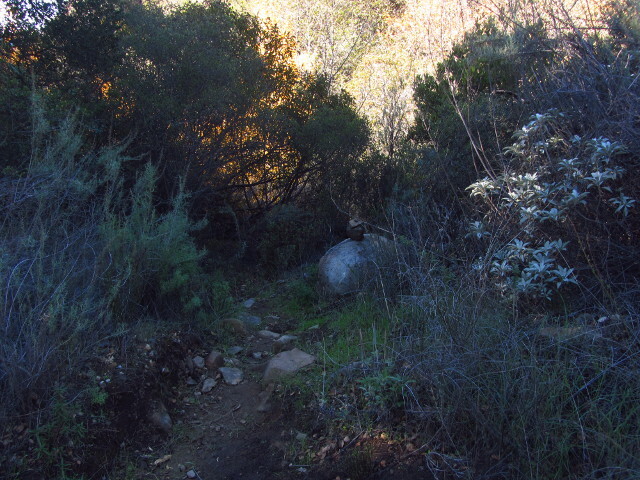 The trail can be seen in the bushes to the right. Looking down Nordhoff Ridge, the rocky prominence to the right is Chief Peak, which looks much smoother from this angle than my view of it before going up it. 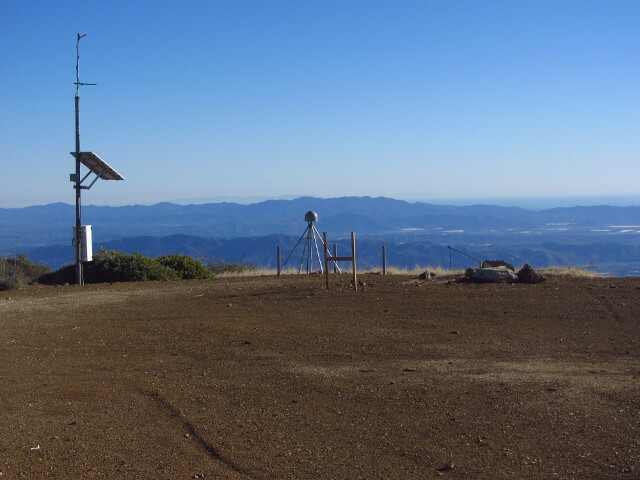 The green bump a little shorter than the mountains beyond on the left holds the metal frame of an old lookout tower that tops Nordhoff Peak. I was getting into the leftover snow and tried to keep to the dry on the left or the shade where it was still icy and solid on the right rather than the muddy in the middle. It was freezing for a while, but winter didn't get in a very tight grip. I arrived at Nordhoff road. Another sign marks the trail down from here. Coming over a last small ridge, the Topatopa Bluff is striking. Footsteps continued down the road in that direction. I turned up a spur on the fire road, gaining elevation and more islands to view out in the ocean and eventually distant coastline poking island-like out of the haze. The Topatopa Bluff draining into Sisar Canyon below. 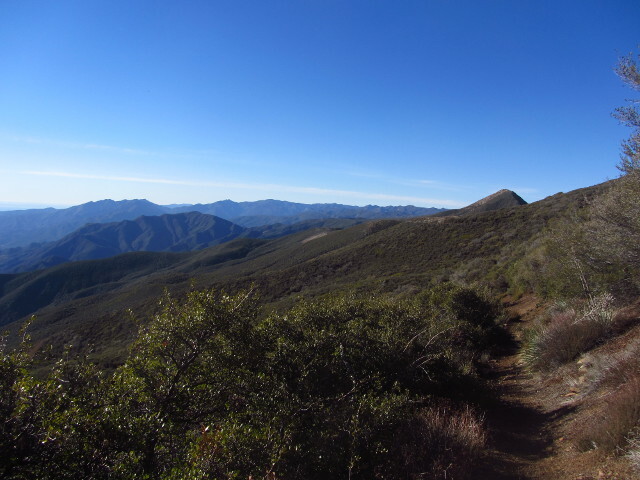 Trails appear to make their way up the ridge line to the north from Nordhoff. 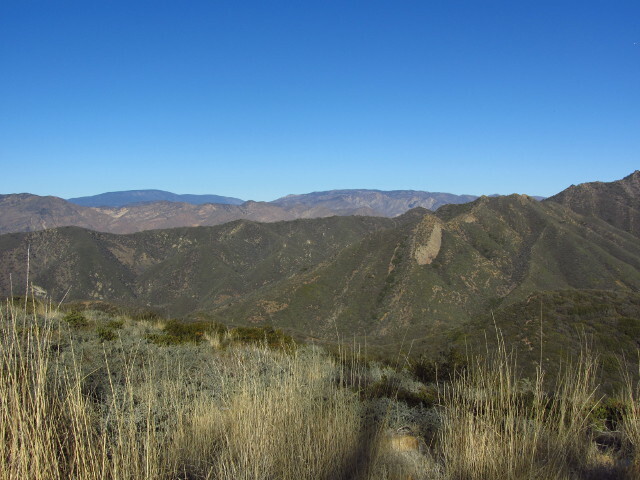 Climbing the peak brought views of the Sespe on the other side of the ridge. I spotted something down the fuel break that turned out to be a PVC tube set upright in the dirt with a hole near the bottom and a piece of wood bolted partly over the hole. A lid of sorts lay in the dirt nearby. 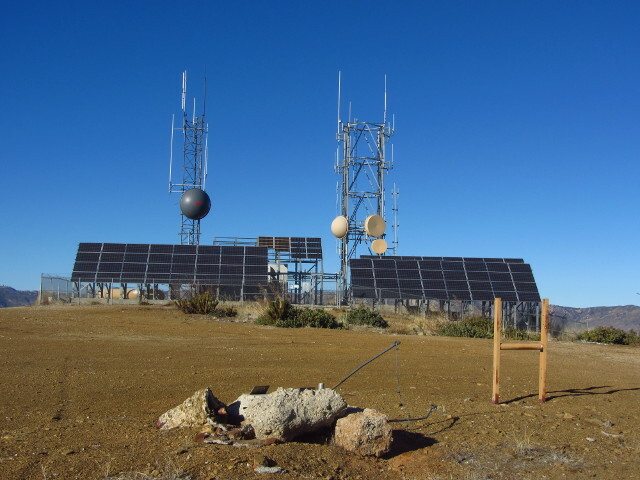 Further up, I found the antennas again, with a mass of solar panels, which is the Sisar Repeater Site. I looked around the flattened top for maybe a benchmark or register but found neither. It is occupied by some concrete rubbish and a very good GPS so that USGS can keep track of exactly how this bit of land moves. I've seen them before, minus explanatory sticker. There was one on South Mt. Hawkins. A really good GPS for studying the shifting of the continental plates. The Sisar Repeater Site, fenced to keep it safe from the like of me. 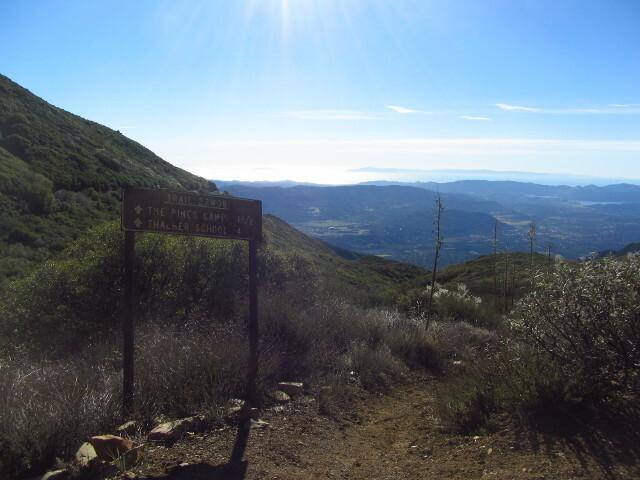 It is 2.5 miles to The Pines, 4.5 miles to Sisar Road, 5.2 miles to Nordhoff Road, and 5.5 miles to the repeater at the top. I walked around the repeater for the views it was trying to block. 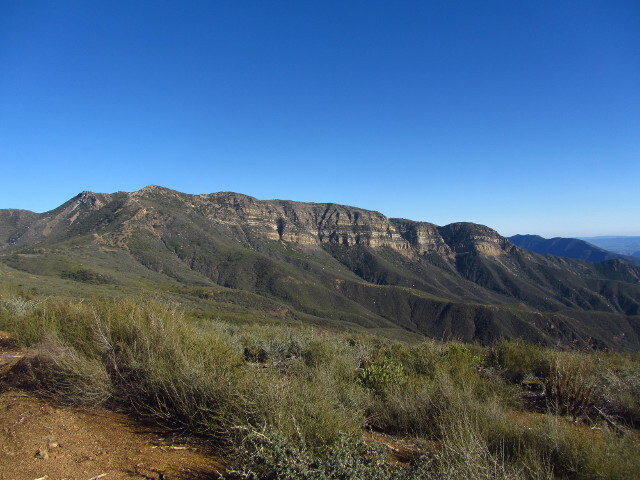 Piedra Blanca with a background of the various peaks of Pine Mountain. The easterly view is still fairly hidden by the local ridges. I started down again, investigating the ultimately uninteresting white thing to the side. I've seen them before too, but so far they do not have explanatory stickers. I noticed a bit of plastic down the ridge from the spur for water collection, but decided not to investigate it. I turned down the trail and made time except for stopping suddenly to sketch. I got down before needing a light. 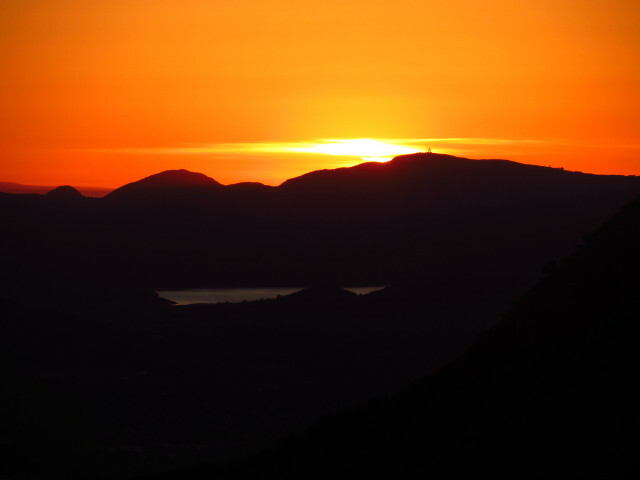 Sun dropping below the ridge, the last light reflecting on Lake Casitas. Great hike to kick off the new year! It was a nice mix of old and new when I hit the ridge. I see from your 22W series that those trees are really Coulter pines, which have extra wicked looking cones compared to Ponderosa (that checks) and actually do live in lower elevations although these are indeed planted.